Under-fire Italian to receive $16.4 million in compensation as part of deal. 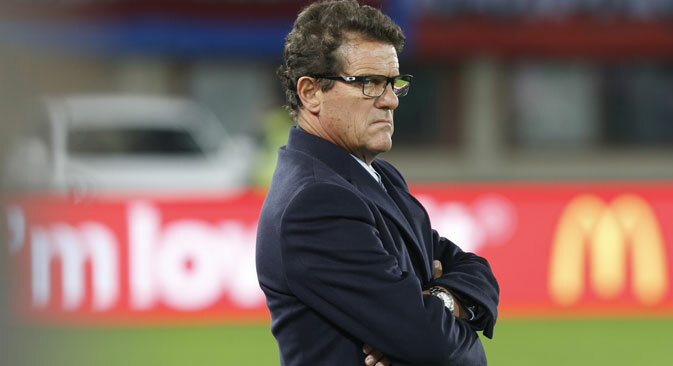 The Russian Football Union (RFU) and chief coach of the Russian national football team Fabio Capello have reached an agreement on terminating Capello's labor contract with the consent of both sides, the RFU press service has said. “The Russian Football Union sincerely thanks Fabio Capello for the work he has done as the chief coach and wishes him success in his further professional activity,” said the press service report published on the Union’s website. In turn, Capello said he was grateful to the Russian Football Union for the assistance and support he had been given through the entire period of his work. “He is also grateful to players for their joint work, and to fans for their sincere support to the national team,” the report said. Capello will receive compensation for the early termination of his contract to the amount of 930 million rubles ($16.4 million), the Russian sport news agency R-Sport reported, citing an unnamed source. According to the Russian media, under the contract, which was scheduled to end in 2018, Capello was to be paid the full amount of compensation in case of the early termination of the employment agreement by the RFU. According to unofficial information, Capello as the head coach of the Russian national team, was paid about 7 million euros ($7.7 million) per year. Negotiations on the reduction of the amount of compensation were conducted personally by Russian Sports Minister Vitaly Mutko in the past few weeks. The question of parting ways with the Russia coach became urgent after the Capello-led team suffered a 0-1 defeat at home to Austria in a Euro 2016 qualifying match on June 14, complicating its position in the group and leading to widespread calls for Capello’s contract to be terminated. In a Euro 2016 qualifying campaign that has been disappointing so far, Russia has collected six points in eight games and is currently ranked third in Group G, meaning it is likely the team will need to win a play-off in order to qualify for the tournament in France. The Russian media sees the coach of CSKA Moscow, Leonid Slutsky, as the main contender for Capello's job. The 44-year-old has been working with the army club since 2009 and has managed to lead the team to the league title on two occasions. Under Slutsky's guidance, the club also twice won the Cup and the Super Cup of Russia. In the 2009-2010 and 2011-2012 seasons, Slutsky guided CSKA Moscow to the UEFA Champions League quarter-finals.